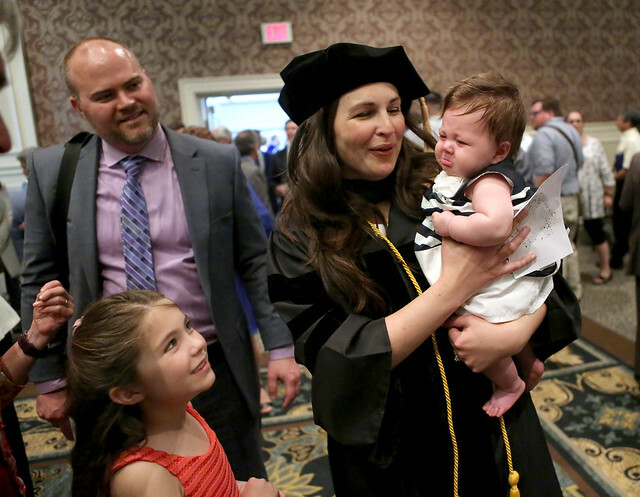 Dr. Laura Brubaker, left, and Dr. Benjamin Abney graduated from Penn State College of Medicine after spending more than a decade in the workforce and raising their own families. The road to medical school is not always a straight path. Some students enter medical school with several years of influential life experience. On May 20, 145 medical students graduated from Penn State College of Medicine, prepared to enter the next phase of their medical education as residents. This year, graduates were asked which classmates stand out as the best examples of College of Medicine values. The overwhelming majority nominated Benjamin Abney and Laura Brubaker. Both students took the road less traveled to medical school, entering the College of Medicine after more than a decade in the workforce and while raising their own families. Laura Brubaker previously worked as a labor and delivery nurse at Women & Babies Hospital in Lancaster, Pa. Most recently, she served as an HIV program coordinator before entering medical school to specialize in obstetrics and gynecology. She chose the College of Medicine based on recommendations of physicians she worked with, as well as its proximity to her family, good schools and outdoor activities. The college’s strong humanities program also aligned with her interest in public and population health. The introduction of a systems curriculum, which focuses on population health and patient socioeconomics, gave Brubaker and her class the opportunity to help patients navigate the health care system. “It taught me the importance of becoming a well-rounded physician,” Brubaker said. She applied to medical schools while expecting the second of her three children, demonstrating that it’s possible to balance work, education and family life. “I think anyone who wants to be a doctor and have a family, who desires something like what I have, would be able to do it,” Brubaker said. Benjamin Abney spent 15 years in the U.S. Navy before enrolling in the College of Medicine to specialize in anesthesiology, He believes his military background not only trained him to persevere through the challenges of medical school, but also helped him appreciate the discipline required and the leadership he witnessed at Penn State Health Milton S. Hershey Medical Center. Abney was challenged to balance education and family life, entering medical school as a husband and father of two. He chose Hershey Medical Center for his residency because of his respect for the faculty and because of the top training he could receive from its high patient volume. He was delighted to find out on Match Day that the Medical Center selected him as well. The two students’ hard work, leadership skills, experience and ability to juggle numerous responsibilities have inspired their peers. Winthrop pointed out that Abney and Brubaker did not let their family responsibilities distance them from the other graduates. Both students actively shared their experiences and demonstrated leadership among their classmates. Brubaker’s previous work in health care also enriched student discussions on topics such how health systems operate, Winthrop said. Abney’s 15 years of naval experience allowed him to travel widely and gain a broader perspective as “someone who really understands how the world works,” Winthrop said. This big-picture perspective was not just helpful in class discussions. Medical students often gathered at Abney’s home for barbecues and even ballroom dance classes. Dr. Milind Kothari, associate dean of student affairs at the College of Medicine, has witnessed Abney’s positive attitude in the face of challenges, as well as Brubaker’s drive to succeed. Both students demonstrated maturity to their classmates and provided a calming influence on those who struggled. See photos of Drs. Brubaker and Abney at the 2018 College of Medicine commencement on Flickr. Brubaker and Abney said they look forward to working more closely with patients during their residencies. As a physician, Brubaker wants to help women experiencing difficult pregnancies and deliveries achieve as much normalcy as possible. She also plans to conduct research on pregnancy complications. In anesthesiology, Abney hopes to become his patients’ advocate, improving their comfort and overall health care experience. Having refined their skills in achieving a healthy work/life balance, Abney and Brubaker are prepared to use them to excel in their residencies and future medical careers. Entry filed under: Profiles. Tags: College of Medicine, commencement, Dr. Benjamin Abney, Dr. Laura Brubaker, work-life balance.